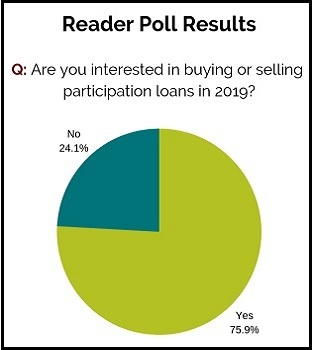 A CreditUnions.com poll asked readers if they were interested in buying or selling participation loans in 2019. The people have spoken: 75.9% of CreditUnions.com readers are interested in buying or selling participation loans in the coming year. For Callahan webinar subscribers who are interested in learning more about participations, Massachusetts cooperative DCU recorded a primer about the strategies, processes, and rules and regulations that govern the growing loan participations market in the credit union industry. From a preview of the 2019 homebuying season to a look at business lending, CreditUnions.com puts on its lending hat and digs into all segments of the industry's loan portfolio. Homes for sale sat on the market for only 54 days in June 2018 — an all-time low according to data and analysis from realtor.com. For lenders hoping to recapture that lightning in a jar, Bob Dorsa, co-founder and president of the American Credit Union Mortgage Association, says the 2019 homebuying season might be different. At least four economic factors will weigh heavy upon credit unions that offer mortgages — which was approximately 57% of the industry at third quarter 2018, per 5300 Call Report data — including the potential for additional rate hikes, a lack of housing supply, and a continued war for talent. For the past seven years, Truity Federal Credit Union has been turning on and off an automated credit card pre-approval program that generates new card accounts when needed and limits card growth when priorities change. The Oklahoma credit union pulls credit reports every other month and assigns non-card members to tiers based on a combination of credit score, bankruptcy indicators, and Reg Z ability to repay criteria. It then typically emails members in the top tiers with an offer to open a credit card account. Members who click “yes” visit a “congratulations” page where they verify basic information, such as their address, and indicate whether they want a cash advance. There’s little friction in that user experience, and members have taken note. The shifting economic landscape over the past 10 years has changed the way financial institutions operate and interact with consumers. As banks and mortgage lenders pulled back following the crash, credit unions stepped in and increased lending when members needed it most. In the 10 years following the recession, the credit union industry has grown its loan portfolio 82.7%. Banks in the United States increased their portfolio 73.4% during the same period. How else has credit union lending has evolved in the past decade? Auto lending at U.S. credit unions was relatively robust in the third quarter despite rising interest rates and slowing growth in the loan portfolio. Up 10.8% annually, total auto lending expanded $35.8 billion over the year to $365.3 billion as of Sept. 30, 2018. Credit union auto market share has grown 5.9 percentage points in the past five years to 20.6% as of Sept. 30, 2018. With the largest market share of any major loan product, auto loans are essential to balance sheet growth at credit unions. Total member business loans for the credit union industry have increased $5.7 billion in the past year. Total commercial loans have increased even more — $6.9 billion. As part of the NCUA’s Regulatory Modernization Initiative, the regulator has made changes to the 5300 Call Report to give credit unions greater flexibility in providing commercial and business loans to their members. Since these changes, how has member business lending grown?